Participation in the Lakes of Missouri Volunteer Program is mostly gathering and processing samples, but our volunteers do make some direct measurements, particularly water temperature and water clarity. We are slowly rolling out a new facet of monitoring that gives volunteers another opportunity to make direct measurements. Each year, typically in May, our lakes stratify (more about stratification). This occurs as the cold lake water begins to warm at the surface. The warmer water is less dense than the cold water, so it remains near the surface. After a period of several warm days, a warm top layer will form. This top layer, the epilimnion, will be distinctly separate from the colder bottom layer and the two will typically not mix, or “turn over”, until the weather cools. There are exceptions. Some lakes will mix on windy days, for example. The timing of stratification and depths of a lake’s layers are important to limnologists (scientists who study inland, or non-ocean waters). Because these layers typically don’t mix, inputs associated with warm water will directly affect the epilimnion. Since the layers are not mixing, warm inputs such as wastewater or nutrient-rich runoff will go directly to the part of the lake where algae grow and fish live. Conversely, cold, spring fed inputs will plunge to the bottom layer, or hypolimnion. Any nutrients in the hypolimnion are typically trapped until the lake mixes again in the fall. The hypolimnion of Missouri lakes is nearly always devoid of oxygen by mid-summer. This means that most aquatic organisms cannot survive for very long at certain depths. To help us measure when lakes stratify, for how long, and how deeply, we are asking some volunteers to measure the temperature of their lakes at various depths. 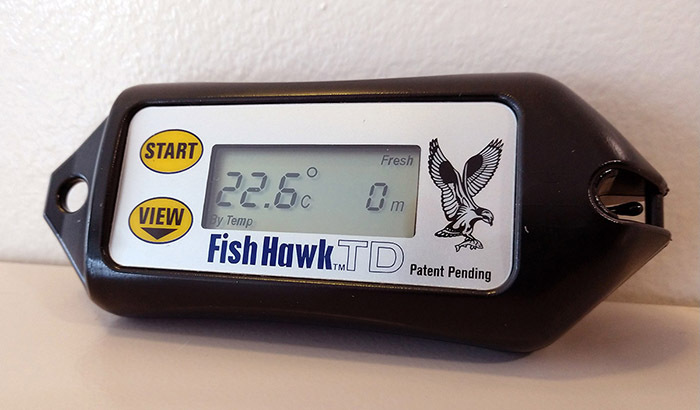 One tool we are using to monitor stratification is an electronic device designed for people who fish (Fish Hawk TD). 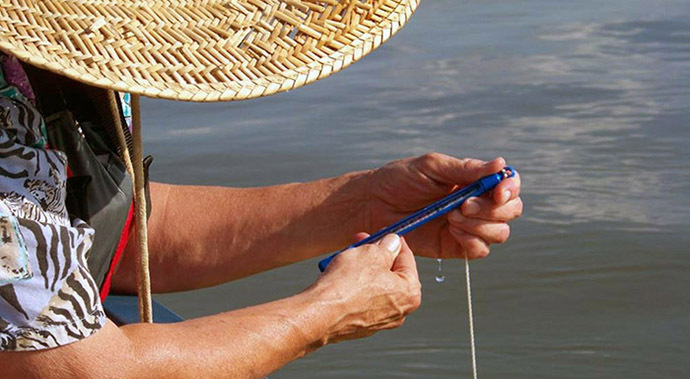 This device is clipped on to a fishing line or weighted string and lowered to the bottom of the lake. When retrieved, the device will display the temperature of the water at 1-meter increments. Volunteers then simply record the temperatures and associated depths on a paper data sheet. This device records temperature and depth as it is lowered to the bottom of the lake and can be purchased at sporting goods stores. In conjunction with the Citizen Lake Monitoring Network in Wisconsin, we are developing an in-house produced temperature sensor. The sensor, at the end of a long cable, can be clipped to the Secchi disk and lowered into the water. The temperature is displayed on the handheld portion. Volunteers will simply record the temperature and depth (as indicated by the Secchi measuring tape) on a data sheet. We hope to deploy these sensors to volunteers at shallow lakes (those around 20-30 feet deep). 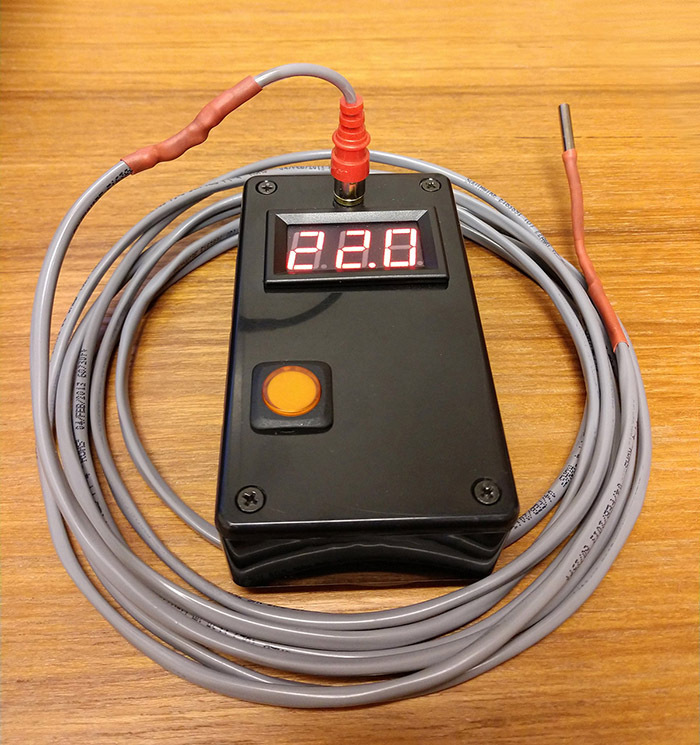 This (prototype) device displays the temperature of the sensor at the end of the cable. After testing, these will be made available to volunteers at shallow lakes. Some LMVP volunteers began recording this information in 2018. Below is a summary of the type of data we are gathering. The graph below is from Table Rock Lake, in the upper James River arm near Cape Fair. Notice that the bottom axis of the graph shows time. The graph ranges from late April through late September. The vertical axis on the left side shows depth, with 0 (the lake surface) at the top of the graph. The colors show the temperature, from cold (blue) to hot (orange). The scale in the bottom left shows the temperature value of each color. The white circles at the bottom indicate the sample dates. This graph shows water temperature at different depths through the 2018 sampling season. The white dots at the bottom show the sampling dates and the line at the top of the green band shows the location of the thermocline. Data from Table Rock Lake, Site 11 (near Cape Fair). To see the surface temperature through 2018, simply follow the top of the graph from left to right and notice the color changes. The lake heated up quickly in early May, reaching the high 80s by the end of the month. You can follow the same procedure for any depth. Another way to view the graph is pick a date on the bottom axis and look up to see where the temperature changes occur. For example, when first sampled in late April the lake was the same temperature from top to bottom, or mixed. Compare that sample date to late June, when the lake was hot on top and cold at the bottom. The depth where the temperature begins to rapidly cool is called the thermocline. We calculate this value based on the rate of temperature change. 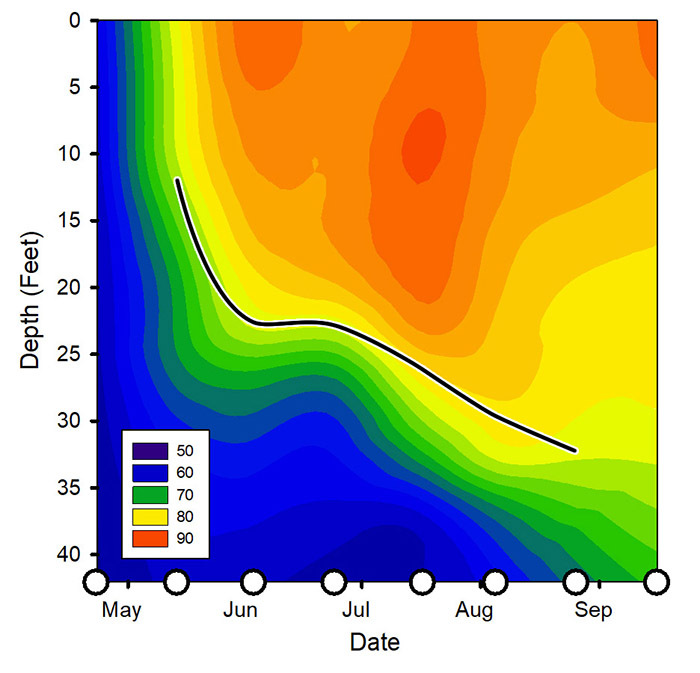 In the graph above, the thermocline is shown by the black line at the top of the green color band. Following the thermocline from left to right, we can see that the depth of the epilimnion (top layer of water) increases from around 13 feet in early May to over 30 feet in late August. If we were to monitor later in the season, we would see the lake cool down and mix again. Below is a graph showing similar data from 2 years of collection by a former LMVP volunteer from a lake in Whitecliff Park (Crestwood, MO). Sensors were deployed in the lake to monitor continuously at several depths. More information about this effort is available in a previous Water Line article, available here. This graph from former LMVP volunteer Howard Webb's monitoring efforts shows 2 years of lake temperature data. Howard deployed sensors in the lake to continuously monitor water temperature. Click to read more. If you are a current volunteer and would like to help us monitor lake stratification, let us know via email info@LMVP.org or give us a call (573-882-5430). The Limnology Lab at the University of Missouri (our home) began a new project in 2017 and is now expanding it across 5 states. 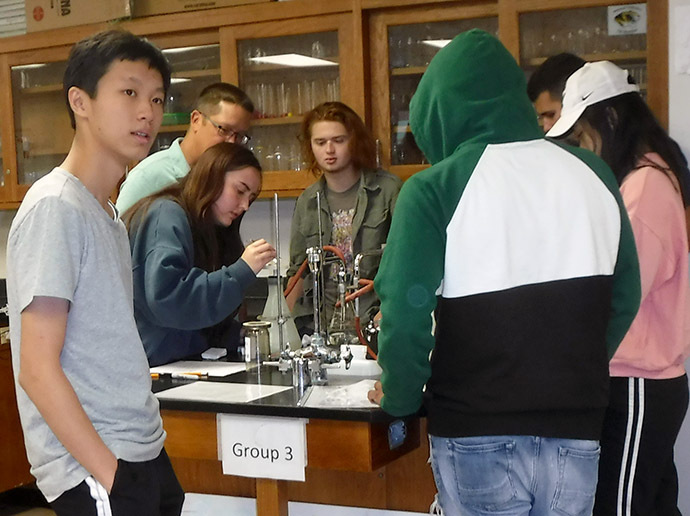 The program, called ROSS (Reservoir Observer Student Scientist) works with high school science teachers and their students to monitor nearby lakes according to a protocol modified from the LMVP methods. Funded by a grant through the North Central Region Water Network, this project will work with students and teachers in Missouri, Kansas, Iowa, Nebraska and South Dakota. Students at Maize High School (Maize, Kansas) collect water samples at Cheney Reservoir for the Reservoir Observer Student Scientist project.